Morocco boasts a rich history of Jewish-Muslim cohabitation, and in the past several years, the kingdom has taken significant steps to strengthen it, while King Mohammed VI is carrying out a wide-ranging effort to revive his country’s Jewish heritage, in gestures of openness to remind Moroccan citizens, and the world, that the country’s Jewish history matters and is worth honoring. “The 2011 Constitution acknowledges that Morocco’s identity has been “nourished and enriched” in part by “Hebraic” components. Around that same time, King Mohammed VI embarked on a wide-ranging rehabilitation project that reflects his “special interest” in the cultural and spiritual heritage of the Moroccan Jewish community,” writes the New York Times. In a feature story published Tuesday (April 9), writer Yaëlle Azagury and Anouar Majid, the editor of Tingis magazine, a Jew and a Muslim who were both born and raised in Morocco, explain how Morocco has preserved its Jewish heritage and overtures onto its Jewish community. They recalled in this connection that with the King’s support, more than 160 Jewish cemeteries with thousands of gravestones have been uncovered, cleaned up and inventoried with funding from the kingdom. In addition to synagogues, former Jewish schools have been renovated. The original names of the Jewish neighborhoods where many of these synagogues have stood for centuries have also been reinstated. As explained by Ms. Rehihil, the goal of the show, in which Moroccan Jews reminisce about their childhoods in villages around the country, is to familiarize them to a Muslim audience that often associates Jews with foreigners. 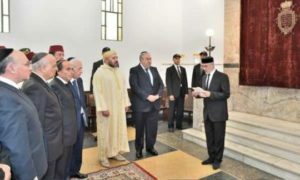 Although the number of Jews in the country does exceed 2,500, compared with some 240,000 in the 1940s, the kingdom’s embrace of Jewish heritage is a strong reminder of the Jews’ rightful place in Morocco’s history, the authors of the article state. “Morocco’s gestures of openness help remind its citizens, and the world, that the country’s Jewish history matters and is worth honoring,” the article concludes. Posted by Hafid El Fassy on April 10, 2019. Filed under Columns, News, Zoom. You can follow any responses to this entry through the RSS 2.0. Both comments and pings are currently closed.